A job seeker looks over material during a HIREvent job fair in San Jose, Calif. Photo by David Paul Morris/Bloomberg via Getty Images. Nothing dramatic on the jobs front this month. 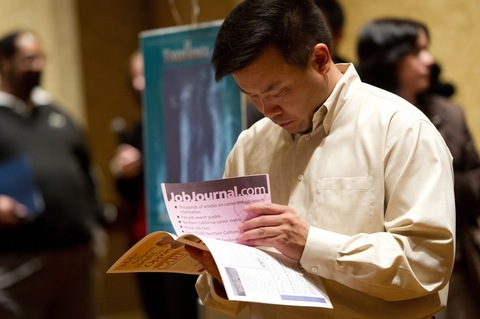 December’s unemployment rate held steady at 7.8 percent. The U.S. added 155,000 new jobs during the month, bringing the grand total of net new jobs for 2012 to more than 1.8 million. The U-7 figure, our all-inclusive measure of the un- and underemployed, dropped from 16.60 to 16.50 percent. The short story seems to be: a couple of hundred thousand more Americans in the workforce; a couple of hundred thousand more with jobs. “Despite their concerns about looming tax increases and government spending cuts, American employers added 155,000 jobs in December, about apace with job growth over the last year, the Labor Department reported on Friday. 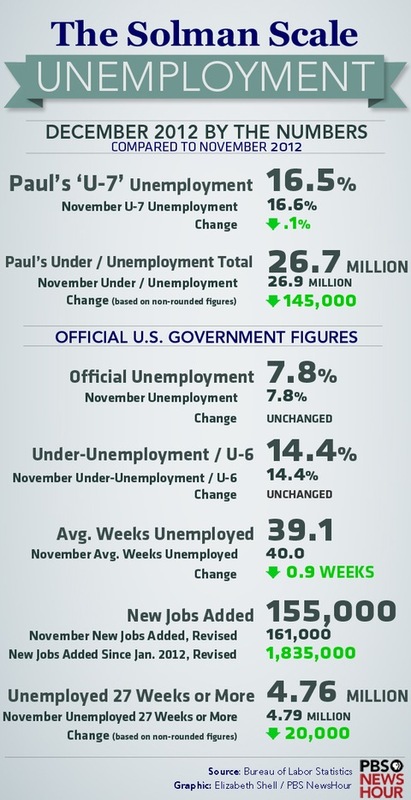 And finally, here’s a link to the monthly “Jobs Byte” post from economist Dean Baker,. Baker follows these data as closely as anyone I know and has helped me make sense of them in the past. His bottom line?